Commercial-quality outdoor products for parks, campgrounds and streetscapes fill the Pilot Rock Web site. The site has been recently updated and expanded to reflect the new catalog. The product line includes park grills, campfire rings, picnic tables, park and street benches, trash and recycling receptacles, smoker waste receptacles, bike racks and more. Check out more than a dozen new products that have been introduced recently. R.J. Thomas Mfg. Co. has been serving the business of recreation since 1959. Concept2 CTS (Commercial & Team Sales) operates alongside Concept2 as a distributor of indoor rowing machines and carbon fiber oars: Concept2's Model D and Model E Indoor Rowers and Dreissigacker Racing Oars. Concept2 CTS serves schools, health clubs and other institutional and commercial customers. Concept2 focuses on supporting individual customers, and designing and manufacturing innovative products. The latest product, Concept2 SkiErg, offers total-body exercise that helps build strength, endurance and flexibility using motions from the sport of Nordic skiing. DuMor Inc. is a U.S. manufacturer of quality site furnishings. For more than 25 years, DuMor has produced a full line of site furnishings, including benches, receptacles, tables and planters, along with numerous other outdoor furnishing products. DuMor backs their products with a strong warranty and remains committed to providing excellent quality and exceptional customer service. Bradley Corp., originators of solid plastic lockers, introduced their new line of spacious and resilient solid plastic Lenox® Gear Lockers, which are wider and deeper than standard lockers, offering more room for athletic and other gear. Comprised of solid high-density polyethylene plastic, Lenox Lockers stand up to harsh, moist environments and damage. Backed by a 20-year warranty. The Perma-Cap® by AVCON® line is an acrylic-based, maintenance-free seat cover made to go over existing wood or aluminum bleachers. The Perma-Plank® line is engineered with a galvanized steel core surrounded by a heavy-duty layer of weather-resistant vinyl, which replaces a wood or aluminum bleacher by reusing the existing bleacher structure. Suitable for indoor or outdoor use, both styles are available in an array of colors and are backed by a five-year warranty. Landscape Structures' Web site turns playground planning into child's play. The site is a complete online resource with playground products and designs, industry information, videos and more. Not only are you able to browse through the innovative playground products, but you can also search for actual playground designs, download CAD drawings and see existing playground sites. And, with a virtual catalog and free planning materials, you have all the tools necessary to start your next playground project. On your next project, let Centaur Floor Systems LLC be your one-stop flooring shop. Centaur doesn't just sell flooring on their Web site, they provide flooring solutions. The Web site has a product page with a list of products for each application, including weight room flooring, cardio areas, aerobics, indoor athletic courts, jogging tracks, multipurpose, childcare, playgrounds, common areas, wet areas, sports fields—soccer, baseball, football and tennis. Sign up for the monthly newsletter. 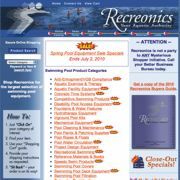 Recreonics offers a comprehensive commercial swimming pool equipment Web site, with 2,000 items representing more than 200 manufacturers. Visit the easy-to-use and secure Web site to source all of your aquatic equipment. Recreonics offers detailed information and competitive pricing on lifeguard suits, deck, maintenance equipment, safety, First Aid, competitive, aquatic exercise, pool inflatables and all other types of equipment for your aquatic facility.